Often librarians wonder what's included in the Ohio Web Library. Worldbook suite of products include Early World of Learning, World Book Student, and World Book Kids. If you'd like to download these lists in a spreadsheet format or if you are curious as to the contents of other EBSCO packages, a comprehensive list is available on EBSCO's page here. Questions? Problems? Something missing? Contact the OPLIN Support Center. Please use the links to the left to find a variety of useful information about the databases. Resources are broken down by database. Getting Started Guide (PDF) This one-page guide created by OPLIN is designed to get your patrons started. Proquest's Guide to African American Heritage This extensive online guide from ProQuest include helpful tips, training, and downloadable resources. Ongoing and Recorded Webinars. These approximately hour-long webinars are conducted by Proquest's training team. Trainings include African American Heritage as well as other Proquest products. The American & English Literature Collections contain many works of poetry, drama, and prose from the 16th through 20th centuries. It includes the complete text of more than 200,000 poems, 2,000 plays, 100 works of prose, 11 major editions of Shakespeare’s works, and 21 editions of the Bible. Access full-text of more than 200,000 essential works of English and American literature. Look for a specific work by author or title. Search for a word or phrase within one book, within one collection, or across all the literature. Ancestry Library Edition delivers billions of records in census data, vital records, directories, photos, and more from countries all over the world. It's resources cover the United States and the United Kingdom, including census, vital, church, court, and immigration records, as well as record collections from Canada, Europe, Australia and other areas of the world. Proquest's Guide to Ancestry Library Edition This extensive online guide from ProQuest include helpful tips, training, and downloadable resources. Ancestry.com's '10 Census Questions that Lead to More Answers' (PDF) This tip sheet from Ancestry details how a patron can take take the information contained in the Census data and use it to find out more information from different sources. Ancestry's 5 Minute Finds. These 5-minute YouTube videos from Ancestry.com show interesting ways to explore Ancestry's collections. Ongoing and Recorded Webinars. These approximately hour-long webinars are conducted by Proquest's training team. Trainings include Ancestry Library Edition as well as other Proquest products. Promotional Database Graphics.These graphics are available to any Ohio public library to use, on a library's website or social media. No attribution required. 8.5 x 11 Poster (PDF) Created by ProQuest. 11 X 17 Poster (PDF) Created by ProQuest. Sample Press Release (Word) Created by ProQuest. Image for promoting this database on social media. Research and study notable individuals worldwide. Access both concise and/or detailed biographies. Search for biographies by gender, occupation, nationality, etc. All EBSCO webinars. Check this list of all available webinars from EBSCO to see training options. Promotion Kit. This file of graphics from EBSCO can assist you in marketing this resource. EBSCO training. This website links to all EBSCO training resources, include upcoming and recorded webinars as well as YouTube Trainings. Business Source Premier offers information from business publications as well as tens of thousands of company profiles. It contains news and journal articles on marketing, management, accounting and more. Also included are company profiles, industry and marketing reports and company financial data. Business Source Premier User Guide This one-page flier from EBSCO can assist in promoting this resource. Step-by-step instructions that provide a one-stop source for automobile repair answers. Videos and animations that show how to complete repairs. Close-up photos and images to enhance understanding of the text. Troubleshooting and diagnostic information that help pinpoint searches. Maintenance and specification tables that highlight key information. Flier. A splashy flier from Gale that highlights Chiton Library. Product sheet. A product sheet from Gale describing the key features of Chilton Library. Social Media Graphic. 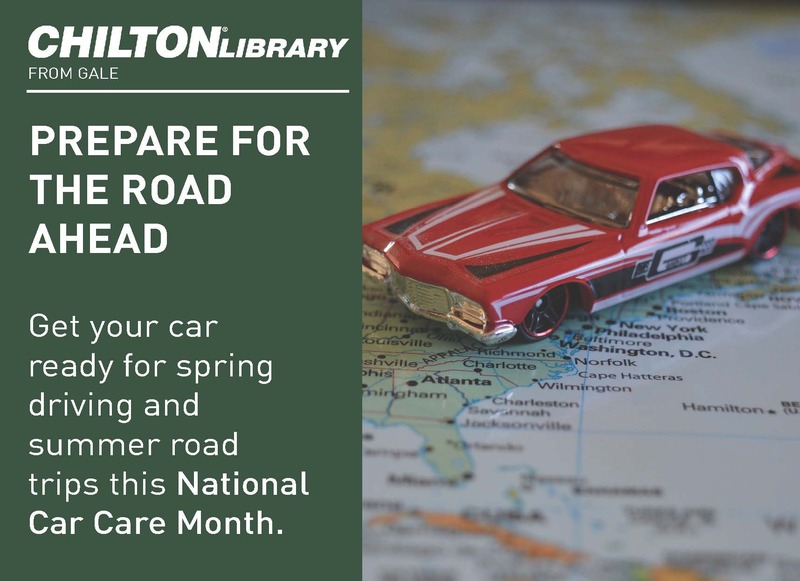 This design from Gale promotes Chilton's for National Car Care Month. Postcard. Promotional postcards from Gale. Consumer Health Complete provides content covering all areas of health and wellness, from mainstream medicine to the many perspectives of complementary, holistic, and integrated medicine. It contains full text for more than 250 health reference books and encyclopedias including the American Medical Association Complete Medical Encyclopedia, Complete Guide to Prescription & Nonprescription Drugs 2012, Cornell Illustrated Encyclopedia of Health, Mayo Clinic Family Health Book, Oxford Handbook of Child Nutrition, and many more. Your Health Matters (PDF). This one-page flier from EBSCO can assist in promoting this resource. Consumer Health Complete Tutorial. This 3-minute YouTube tutorial from EBSCO contains a quick overview of the Consumer Health Complete interface. Proquest's Guide to Fold3 Library Edition This extensive online guide from ProQuest include helpful tips, training, and downloadable resources. Fold3 Library Edition. These 3-minute YouTube videos created by ProQuest Training are a good place to start learning about Fold3 Library Edition. Topics include searching, the catalog, understanding the image viewer and the interactive viewer. Ongoing and Recorded Webinars. These approximately hour-long webinars are conducted by Proquest's training team. Trainings include Fold3 Library Edition as well as other Proquest products. Proquest's Guide to HeritageQuest This extensive online guide from ProQuest include helpful tips, training, and downloadable resources. Ongoing and Recorded Webinars. These approximately hour-long webinars are conducted by Proquest's training team. Trainings include HeritageQuest as well as other Proquest products. User Guide.The links on this page are designed to cover the basics of searching and browsing the Hobbies & Crafts Reference Center interface. EBSCO Tutorials. On this page, you can find a powerpoint and a video recording of a tutorial on Hobbies and Craft Reference Center. User Guide.The links on this page are designed to cover the basics of searching and browsing the Home Improvement Reference Center interface. EBSCO Tutorials. On this page, you can find a powerpoint and a video recording of a tutorial on Home Improvement Reference Center. All Marketing Materials from Gale. Literary Reference Center provides you with abroad spectrum of information on thousands of authors and their works across time and literary discipline. Plot summaries, synopses, and work overviews. Nearly 100,000 pieces of literary criticism. More than 693,000 book reviews. Full-text poems and short stories. User Guide. For an in-depth understanding of Literary Reference Center, try this in-depth guide. FAQ. This guide compiles frequently asked questioned about Literary Reference Center. Literary Reference Center -Tutorial. This video tutorial from EBSCO guides users on how to use the interface. Scavenger Hunt. Try these fun scavenger hunts with staff in order to learn more. Promotional Materials from EBSCO. This promotional kit from EBSCO include bookmarks, posters, graphics and promotional emails. EBSCOhost delivers articles from more than 6,000 magazines and newspapers, most in full text, ranging from children's magazines to professional research journals. Different interfaces designed for specific age groups and curricular areas make EBSCOhost easy to use for all researchers. Magazine and journal articles are contained in two databases: MasterFILE, which is primarily popular magazines, and Academic Search Premier, which is primarily academic or scholarly journals. Academic Search User Guide (PDF) This one-page flier from EBSCO can assist in promoting this resource. Introduction to EBSCOhost Short YouTube video from EBSCO. Also available as a download. Reading an Article on EBSCOhost Short YouTube video from EBSCO. Also available as a download. Advanced Searching on EBSCOhost. Short YouTube video from EBSCO. Also available as a download. Creating Journal Alerts on EBSCOhost Short YouTube video from EBSCO. Also available as a download. Citing Article on EBSCOhost Short YouTube video from EBSCO. Also available as a download. Academic Search Poster This 8.5 X 11 inch poster created by EBSCO outlines what a patron might use Academic Search Premier for. How to use the Encyclopedia of Social Work This short training from Oxford University Press is hosted on Youtube. How to use the Oxford Classical Dictionary This short training from Oxford University Press is hosted on Youtube. How to use the Oxford Research Encyclopedias This short training from Oxford University Press is hosted on Youtube. Training calendar. These live demonstrations and training sessions hosted by the vendor's product expert to introduce you to the OREs. Simply register and reserve a space; you will then be provided with the session URL and password. Sessions last 45 minutes. Demonstrations are conducted using a service called WebEx -— all you need is a phone and a computer with an internet connection. Bookmark Created by Oxford University Press. Shelf Tag Use this shelf tag with the book versions of Very Short Introductions to alert your patrons to the digital edition. FAQ Often asked questions about Oxford Research Encyclopedias. Point –the arguments supporting one side of the issue. Counterpoint –the arguments supporting the opposing side. Guide to Critical Analysis–questions and tips to help you analyze the issue in-depth. In addition, Points of View Reference Center lets you easily search leading political magazines from both sides of the aisle, newspapers, radio and TV news transcripts, primary source documents, and reference books for more information. POV is updated twice a day. Locate the residences and workplaces of ancestors. Understand the significance and historical evolution of buildings. See what your town looked like in the past and how it has changed over time. About the Sanborn Map Collection. This guide from the Library of Congress is a detailed guide to Sanborn Fire Insurance colors, keys and symbols. EBSCO’s Science Reference Center provides easy access to full-text, science- oriented content appropriate for middle and high school students. Science Reference Center contains full text for hundreds of science magazines, journals, encyclopedias, reference books and other reliable sources. In addition, the database includes a vast collection of images from sources such as UPI, Getty, NASA, National Geographic and the Nature Picture Library. Science Reference Center -Tutorial. This video tutorial from EBSCO guides users on how to use the interface. Scavenger Hunt. Try these fun scavenger hunts with staff in order to learn more about this resource. User Guide.The links on this page are designed to cover the basics of searching and browsing the Small Business Reference interface. Social Media Images. Social media posts from Transparent Language Online for any number of holidays and on multiple platforms. Letter Size Customizable Flier. This flier from Oxford University Press has a space for libraries to enter their own information. Quiz (DOC) Use this quiz to learn how to use the resource. Tour This presentation, available as a PPT and PDF, walk the viewer step by step through the resource. Recorded Demo This recorded tour of Very Short Introductions requires a login. Top 10 Things You Should Know From Very Short Introductions. This YouTube series from Oxford University Press highlights 10 takeaways from Very Short Introductions. Subscriber services, such as VSI MARC Records. These pages contain information on accessing Very Short Introductions, managing your subscriptions, and getting help if you have a problem. World Book Early World of Learning, part of the resources available through World Book, is an online resource for preschoolers and early elementary grade students. Trek’s Travels – narrated stories, interactive games, and original videos that teach critical early childhood themes, including numbers, shapes, colors, opposites, and more. Welcome to Reading – practice to develop and strengthen phonics, vocabulary, phonemic awareness, and comprehension skills. Online Help. A website from World Book designed to help and train libraries and educators on World Book Early World of Learning. World Book Kids is a general reference website developed especially for kids. The site offers simple search and browse navigation, easy to read articles with embedded multimedia, thousands of illustrations, and a wealth of engaging activities. Just about any subject – Find thousands of easy-­‐to-­‐read articles, images and illustrations, as well as interactive games and activities. Games – Keeps kids engaged in research. Search by subject or game type. These educational games cover a variety of topics. Hands-­‐on Activities – Keeps kids actively working using their hands and logic skills. Definitions – Double click on any word in an article and the World Book Dictionary will define it. State and Country information – The Atlas provides up-­to-­date, full-‐color maps of the world, continents, countries, states, provinces, and many cities. World Book Kids Tutorial This page from World Book contains several helpful video tutorials. Online Help. A website from World Book designed to help and train libraries and educators on World Book Kids. ↵World Book Student includes the World Book Encyclopedia, the World Book Dictionary, and the World Book Atlas. It contains an extensive multimedia collection, including editor-­selected websites, correlations to state standards, and much more. Just about any subject – More than 40,000 encyclopedia and reference articles; thousands of websites, images, and illustrations; interactive games and activities; and more. State and Country information – The Atlas provides up to date, full color maps of the world, continents, countries, states, provinces, and many cities. World Book Timelines allows you to discover and map important events with accurate information powered by World Book’s wealth of knowledgeable resources. There are over 400 interactive timelines to learn from. • Browse existing timelines in subjects such as art, literature, notable people, parts of the world, science and technology, sports, and world history to visualize the cause and effect relationship between events. • Organize information visually for genealogy, local history, or school projects. • Work individually or in small groups to save existing timelines, edit and customize existing timelines or create your own timelines on any subject. Online Help. A website from World Book designed to help and train libraries and educators on World Book Timelines. Are you interested in sharing your research expertise with the library community? Or an opportunity to boost your professional development by doing some training? Become an Ohio Web Library Specialist! OPLIN's Ohio Web Library Specialists help libraries by providing professional in-person training in effective use of Ohio Web Library resources. What is an Ohio Web Library Specialist? Ohio Web Library Specialists train library staff and patrons to use Ohio Web Library resources effectively. Ohio Web Library Specialists serve as an expert in their region on these tools. The Ohio Web Library Specialist will endeavor to work with local libraries to provide the type of trainings that staff need. This training can include stand-alone sessions, webinars, part of a staff in-service day or regularly scheduled staff meeting. These training sessions will deepen understanding of Ohio Web Library resources in a practical, hands-on way. How can I become an Ohio Web Library Specialist? OPLIN is currently training the inaugural class of Ohio Web Library Specialists. Our next round of applications will be in Spring 2019. What’s expected of an Ohio Web Library Specialist? Each Ohio Web Library Specialist is expected to attend a one hour training and idea sharing on the subject(s) of his/her selected database. In addition, Ohio Web Library Specialists are expected to provide one training to library staff annually. This can be a stand-alone session, a webinar, or part of a staff in-service day. Ohio Web Library Specialists should report training dates and numbers of participants to OPLIN. In addition, the specialist must provide their own copies of handouts. Trainers are solely responsible to determine the day, time and provision of a facility for their trainings. OPLIN will reimburse mileage for trainers, but will not pay for a trainer stipend, computer lab, or other expense or liability, which may be incurred through offering this instruction. How does becoming an Ohio Web Library Specialist benefit me and my library? Certified as an authorized Ohio Web Library Specialist, a role that can be used to demonstrate professional learning growth. Learn about Ohio Web Library tools and resources updates first. Be connected to the online learning community of trainers to share ideas and training resources. Local trainer for professional development training on the Ohio Web Library. Knowledge growth through sharing in the online learning community for Ohio Web Library Specialists. Ability to encourage the use of Ohio Web Library resources by staff and patrons in a thoughtful manner. Willingness to learn and try new technologies. Interest in helping other library staff members learn new technologies. Experience or interest in presenting classroom-style training. What kind of training do Ohio Web Library Specialists receive? Selected applicants will participate in an online webinar. The webinar will cover best practices and resources for training. Ohio Web Library Specialists will be re-certified each year through a training webinar. Sara Churchill Public Library of Youngstown & Mahoning County schurchill AT libraryvisit.org Biography Reference Bank, Chilton Library, Consumer Health Complete, World Book Online, Explora, Hobbies & Crafts Center, Kids InfoBits, Literary Reference Center, Lynda.com, Oxford Research Encyclopedias, Points of View Reference Center, Sanborn Fire Insurance Maps, Science Reference Center, Transparent Languages Online, Very Short Introductions. Kim Bishop Dayton Metro Library kbishop AT daytonmetorlibrary.org Chilton Library, EBSCOhost,Biography Resource Center, Consumer Health Complete, Hobbies & Crafts, Home Improvement, Lynda.com, Points of View, Science Ref Center. Some of the Ohio Web Library vendors provide MARC records that can be loaded into a library's catalog, so their online resources will appear in catalog search results. These MARC records will contain a link to the resource in the 856 field of the record (subfield u); however, for people outside the library, these links will not allow access to the resource, because they do not pass through the user authentication associated with our statewide subscriptions. For example, a link to Consumer Reports in the MARC record downloaded from EBSCO might have "http://search.ebscohost.com/direct.asp?db=f5h&jid=%22CRP%22&scope=site" in the 856u tag, and that would need to be changed to "http://oplin.org/auth?url=http://search.ebscohost.com/direct.asp?db=f5h%26jid=%22CRP%22%26scope=site". One easy way to make these modifications is to use Terry Reese's MarcEdit tool that can be downloaded free from http://marcedit.reeset.net/downloads. Open the MarcEditor, open the file of MARC records downloaded from the vendor, and from the "Tools" menu choose "Edit Subfield Data." In field 856, subfield u, look for field data http:// and replace it with http://oplin.org/auth?url=http://. Repeat this process, looking for & and replacing it with %26. Save the edited file and it should be ready for importing into your catalog. A large selection of MARC record files can be downloaded from the EBSCO Administrator interface, http://eadmin.ebscohost.com/eadmin/login.aspx. (If you don't know your login credentials, contact http://support.oplin.org.) Navigate to "Database Title Lists" and click on the "MARC 21" tab. World Book provides some very general MARC records at http://www.worldbookonline.com/training/marc/. Libraries Connect Ohio (LCO), a partnership of OPLIN, OhioLINK, and INFOhio, built off the previous success of prior 5-year contracts to select the products in the current five-year statewide resource package which will start July 1, 2018. The five-year contract ensures optimal pricing from vendors. The selection process began in July of 2017. In that month, heads of the partner organizations met to set a project budget. A steering committee of three staff members from each partner organization was formed in order to guide the process. In the following month, that steering committee recruited and appointed five members from their respective communities to a database selection committee, joined by one person appointed by the State Library. In addition, the steering committee worked to set mandatory service elements in the RFP as well as primary and secondary service elements. The RFP was posted by the Ohio State University, acting as fiscal agent for LCO, on September 12, 2017. Responses were due by October 11, 2017. Vendors were required to use a response form designed to align with the specifications outlined in the RFP. Twenty-one (21) information vendors submitted proposals for over 60 products and product packages by the October 11 deadline. These proposals covered a very broad range of subject areas and formats. Communicating by a closed email list, the selection committee then reviewed the submitted proposals. The selection committee broken in to subcommittees by library type to review proposal documents and test product performance through temporary access provided by the vendors. The goal of each subcommittee was to prioritize and review proposals using a standardized form based on the criteria outlined in the RFP. This standardized form assigned a numeric value to the review to assist in prioritization. The selection committee then met in person on November 13, 2017 to discuss all the proposals and select vendors and products for further negotiation. The day began by each subcommittee reporting out the scoring given to products and product packages. Using this scoring system allowed the committee to focus on those products which were ranked the highest. Using this system eliminated approximately half the products and product packages. The committee then dissected the product packages and discussed the priority of the component parts. By the end of the day, a prioritized list of products was decided, even though the cost of the products in the list exceeded the available funds. OhioLINK then immediately began the process of negotiating lower prices where possible, and weeding out some lower-priority products, in order to meet the budget constraints. The selection committee next met for an online update on February 5, 2018. In this session, OhioLINK updated the selection committee on the progress of the negotiations. Not all pricing goals were met. Thus, the selection committee faced some difficult decisions for which products to include in the final proposal. Each subcommittee articulated the needs of their community. Based on this information, OhioLINK continued to negotiate with vendors to get the best price possible. Another update call was held on February 21, 2018. At this meeting, a vote was held to approve the suite of resources. The suite was unanimously approved by the selection committee. The final results of this selection process, and the negotiations were presented on March 15, 2018 to the State Library Board for approval of the LSTA funding component of the budget. The State Library Board voted unanimously in favor of the proposal. The 2019 meeting of the Content Advisory Committee was held on March 28, 2018. A 2019 meeting has not yet been scheduled. Meetings will be held at the OPLIN office, 2323 W. Fifth Ave., Suite 130, Columbus. In keeping with the purpose and goal of the Ohio Public Library Information Network (OPLIN) as defined in Ohio Revised Code 3375.64, OPLIN acquires access to electronic information resources, and develops electronic resources, for the use of all residents of Ohio. To assist in the selection of these information resources, the Board hereby charters a Content Advisory Committee. Recommend changes to OPLIN and/or vendor support of information resources, including statistics. The advisory committee shall consist of ten (10) members and may not include any OPLIN Board members. Members serve voluntarily at the invitation of the OPLIN Director and will constitute a cross-section of the Ohio public library community including reference and public service managers in public libraries. Members shall be recruited from library systems that invest in content beyond what OPLIN provides. Membership will be reaffirmed at the annual spring planning meeting of the OPLIN Board. This committee nominates five (5) of its members to be part of any Libraries Connect Ohio advisory committee, which would also include five members from OhioLINK and five members from INFOhio. Such a committee will meet as needed to define the core Ohio Web Library collection. The OPLIN Board recognizes that purchasing information resources statewide through the Libraries Connect Ohio partnership (http://librariesconnectohio.org) is the most economical way to provide a core collection of information resources and library services that will help all Ohioans. The Board also recognizes, however, that the information needs of public libraries sometimes differ from the needs of libraries supporting the curriculum of a school or college. This committee will therefore define any additional information needs of public libraries, despite the fact that funding for resources in addition to the resources purchased for the Ohio Web Library may not exist at the time. Committee recommendations regarding the content of the Ohio Web Library collection will be used to inform the work of committee members serving on any Libraries Connect Ohio advisory committee. Meetings: The committee will meet at least one time a year. Because this committee may make recommendations to the OPLIN Board regarding purchases, it may be considered a "public body" under Ohio's Open Records and Open Meetings laws; committee meetings will therefore be open to the public. While members may attend by telephone or Internet connection, they must be present to participate in any vote or be counted toward a quorum. Notices of meetings will be posted at http://oplin.org in accordance with Ohio's Open Records and Open Meetings laws. Minutes: Minutes of each meeting shall be created by OPLIN staff attending the meeting. After review by the committee, they will be posted at http://oplin.org. Recommendations and Reports: Committee recommendations and reports will be submitted to the OPLIN Board through the OPLIN Director prior to the Board's annual planning meeting. Recommendations will include both suggested action and justification for suggestions. This charter shall be reviewed at the annual planning meeting of the Board of Trustees of the Ohio Public Library Information Network. Adopted by the OPLIN Board October 11, 2013. See the navigation panel to the left for links to annual meeting minutes. The 2015 annual meeting of the Content Advisory Committee of the Ohio Public Library Information Network (OPLIN) was called to order at 10:05 a.m. on Thursday, February 26, 2015 by OPLIN Director Stephen Hedges at the OPLIN office in Columbus, Ohio. Present were committee members: Don Boozer, Tamar Kreke, Kirstin Krumsee, Francie Labriola, Chris May, Joe O'Rourke, Jeff Regensburger, and Randall Fulks; David Topoleski and Charley Voelker were unable to attend. The agenda was approved as presented without a vote. The minutes were approved as read without a vote. There was general discussion of recent interface changes by vendors. Stephen Hedges noted that they make more use of graphic elements. He also reported that database usage continues to decline by about 20% a year. This initiated a discussion of database marketing. The committee felt it was important that libraries be able to brand the databases as their own, and might then be more likely to "sell" them. Most of the committee members put their databases under a "Research" tab on their websites. More use of social media was suggested, perhaps to promote the most useful research resources, as well as possibly developing a network of local experts who could support and promote database use. Additional resources the committee recommended included Lynda.com, auto repair information, and foreign language instruction. The committee reviewed some proposed changes to the ohioweblibrary.org search page. There was discussion of the single search box as opposed to "app" buttons for individual databases. There was also discussion of graphic additions to the page to make it more visually appealing. The committee favored grouping of databases within subject categories. Stephen Hedges asked if there was any more business to come before the committee. None appearing, he thanked the committee members and adjourned the meeting at 11:40 a.m. The 2016 annual meeting of the Content Advisory Committee of the Ohio Public Library Information Network (OPLIN) was called to order at 10:05 a.m. on Wednesday, February 17, 2016 by OPLIN Director Stephen Hedges at the OPLIN office in Columbus, Ohio. Present were committee members: Randall Fulks, Tamar Kreke, Kirstin Krumsee, Francie Labriola, Joe O'Rourke, Jeff Regensburger, David Topoleski, Anne Wachs, and Holly Varley; Don Boozer was unable to attend. Stephen Hedges briefly presented the changes to the Ohio Web Library search interface that had been implemented after the last committee meeting. He also presented the graphics OPLIN created for promoting the databases. Stephen Hedges explained the financial reasons for the cancellation of the contract for the LearningExpress Library resources. INFOhio suffered an unexpected budget cut in the current biennium budget, and none of the other Libraries Connect Ohio partners could cover the shortfall. Stephen Hedges provided Ohio Web Library usage statistics, both from the schools and colleges and from the public library community. The public library usage no longer seems to be declining, but still lags behind school and college usage with the exception of Ancestry Library Edition. Stephen Hedges presented a table of funding information for the Ohio Web Library, showing resource cost and cost allocation among the partners both before and after the INFOhio budget cut. He explained that the Libraries Connect Ohio partners have concerns about the disconnect between the cost allocations and the collection usage, and are seeking ideas for correcting the imbalance. In two years, Libraries Connect Ohio should be evaluating bids for the next group of five-year contracts for online resources. Can we tweak that process to improve the situation? There was discussion of the current selection process, and Anne Wachs noted that more information about this process needs to be communicated to the library community, since many do not understand why certain databases are selected while others are not. Ensuing discussion raised many questions. Can the EBSCO package be broken into pieces, with some available only to certain library communities? Can the RFP be structured to request pricing on some resources for public library access only? Would better marketing of the collection improve usage? It was noted that marketing includes offering the resources people want. Committee members' libraries tend to buy resources for lifelong learning, financial planning, and repair instructions to meet demand not filled by the Ohio Web Library. What online resources are you currently buying? What is your budget for such purchases? What requests for information are you unable to satisfy? What online resources (up to 10) do you consider indispensable? What online resources do you have now, including the Ohio Web Library, that you feel are not useful? On motion of David Topoleski and second of Kirstin Krumsee the Board adjourned at 11:40 a.m. The 2017 annual meeting of the Content Advisory Committee of the Ohio Public Library Information Network (OPLIN) was called to order at 10:00 a.m. on Thursday February 23, 2017 by Mandy Knapp, OPLIN Digital Resources Manager at the OPLIN office in Columbus, Ohio. Present were committee members: Randall Fulks, Tamar Kreke, Kirstin Krumsee, Francie Labriola, Joe O'Rourke, Jeff Regensburger, David Topoleski, Anne Wachs, and Holly Varley; Don Boozer was unable to attend. OPLIN Director Stephen Hedges was also in attendance. Mandy Knapp shared current statistics for OPLIN databases from the public library community. 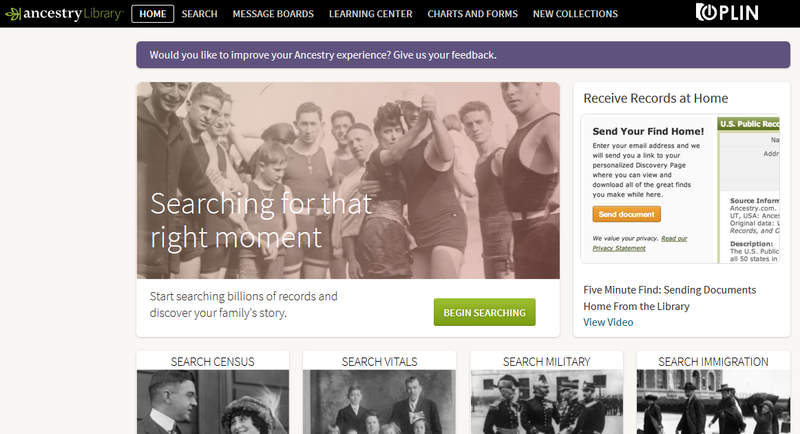 Ancestry Library Edition continues to be the most widely-used resource by public libraries. Mandy Knapp discussed the challenges reporting vendor statistics, including lack of consistency. David Topoleski suggested that the ITN (RFP) include information from the vendor about the level of statistical reporting available. Holly Varley suggested that the ITN committee ask specifically for samples of reports from vendors. Jeff Regensburger noted that sessions appear to be the best statistic to report on at this time. Tamar Kreke, Francie Labriola, David Topoleski, Anne Wachs, and Holly Varley will represent OPLIN on the ITN Committee. The committee discussed the need to gather feedback from the library community for direction on databases. Suggestions included surveys and focus groups. A. Vendor webinar during ITN process. After discussion, the committee decided to decline a vendor’s offer of a vendor webinar during the ITN process. Tarmar Kreke noted that librarian-lead trainings are often more helpful than the vendor-sponsored trainings. Mandy Knapp discussed the ways of modelling the iCoaches program: regionally, by consortium or by expertise. Anne Wachs noted that there are many existing experts out in the library field; they just need to be organized and recognized. Jeff Regensburger notes that it would be worthwhile to reach out to OLC to add information Ohio Web Library Information to the Ohio Reference Excellence Module. Mandy Knapp asked about the evaluation of these trainings and the possibility of using the same questions as other state projects with some modifications. Anne Wachs noted that it was important to evaluate right away. Mandy Knapp mentioned that the state of Iowa has had some success marketing their databases through yard signs. David Topoleski noted that digital signage that libraries were able to add branding to would also be helpful and also a paragraph suitable for library newsletters would also work well. Mandy Knapp asked about the usefulness of bookmarks; several committee members noted that they are useful as handouts. Mandy Knapp asked if there was any more business to come before the committee. None appearing, she thanked the committee members and adjourned the meeting at 12:15 p.m. The 2018 annual meeting of the Content Advisory Committee of the Ohio Public Library Information Network (OPLIN) was called to order at 11:04 a.m. on Wednesday March 28 by Mandy Knapp, OPLIN Digital Resources Manager at the OPLIN office in Columbus, Ohio. Present were committee members: Randall Fulks, Tamar Kreke, Kirstin Krumsee, Francie Labriola, Joe O'Rourke, Jeff Regensburger, Anne Wachs, and Holly Varley; Don Boozer and David Topoleski were unable to attend. 3.1 Update on LCO databases Mandy Knapp updated the committee on the outcomes of the Libraries Connect Ohio Database selection committee. *3.2 Discuss Responses to Genealogy RFP. After a lengthy and robust discussion of the needs of public libraries and the bids proposed, the committee prioritize the databases and made recommendations for how to OPLIN staff should proceed. *3.3 Discuss Responses to Careers and Workforce RFP After a lengthy and robust discussion of the needs of public libraries and the bids proposed, the committee prioritize the databases and made recommendations for how to OPLIN staff should proceed. 3.4 Ohio Web Library site—ideas for improvement. The committee discussed the current Ohio Web Library. Tamar Kreke noted that there had been a substantial redesign 2 years ago. Committee members had new ideas for subject headings and offered to assist with descriptions of databases. 3.5 Marketing materials. The committee members discussed what tangible materials would be good for marketing new resources. Several committee members mentioned the importance of allowing libraries to brand their own items. 3.6 Committee vacancy. Don Boozer is no longer able to participate on the committee. Mandy Knapp asked the committee for ideas for new committee members. Several worthy names were mentioned. Mandy Knapp asked if there was any more business to come before the committee. None appearing, she thanked the committee members and adjourned the meeting at 2:20 p.m. Please see the attached chart for a full explanation of how database authentication at OPLIN works. Incident Response: OPLIN staff will respond within one hour to malfunctions of database authentication during regular business hours Monday through Friday from 8:00 a.m. to 5:00 p.m., excluding State of Ohio holidays; contact us through the OPLIN Support site. What do I need to give OPLIN in order for you to authenticate one of the extra databases my library purchases? First, the vendor has to be able to do authentication based on IP address only. This usually isn't a big issue; we've only run into one small vendor out of the hundreds that libraries subscribe to that couldn't handle it in some way. Second, we need a generic link to the resource, that is, it doesn't have any information in the URL that is specific to any one library. We keep a database of generic links here at the office, since the same link will work for any library. Lastly, you just need to give the vendor your OPLIN proxy IP address. All the authentication in the world won't save us if the proxy IP address doesn't have access. OPLIN proxy IPs always start with 66.213.41 and have a 4th octet of whatever their FSCS is. For example, Ada (OH0001) is 66.213.41.1. We will try to set up authentication for anything that you request. Why must I have a static IP address for my branch libraries to authenticate access to the Ohio Web Library databases? Technically, you don't, unless the database vendor does not allow access from outside a library building, because patrons at the branch can just authenticate to the Ohio Web Library databases as if they were at-home ("remote") users. If you want your patrons to have seamless, in-library access, however, and to have their usage of the databases automatically added to your library statistics, we have to give the vendor an unchanging, static IP address they can associate with your library. If you have further questions, please contact OPLIN Support. If you want to use OPLIN's authentication system, use the OPLIN proxy link. If you'd prefer to use your own proxy or WAM, use the Unproxied link. If you would like the Unproxied link for Chilton Library or KidsInfoBits, please contact OPLIN Support. To sign in to the Lynda.com app with your library card, select the "Already a member?" option. Then choose the "Organization" tab, and enter your library's web address as the web portal. You'll be directed to a page where you can enter your library card number and PIN or password to connect your library card to the app. Lynda accepts many variations of your library's web address, so try entering it differently, for example, without http at the beginning, or with https. Here is a step-by-step guide to setting up the Lynda App. Unfortunately, the Lynda app is not available for these patrons. Once the patron updates their library card and/or PIN in your library's catelog, that information should work in Lynda. To reset a patron's password on a Lynda account, he or she must call Lynda customer service at 1-888-335-9632. How to Share Certificates of Completion. Once a Staff/Patron completes the entire course they will be able to save the Certificate of Completion to their desktop in a PDF format. Have them login into their LinkedIn, Facebook or Twitter accounts and post The Certificate of Completion to their account to share their achievement. In LinkedIn, if they click on their profile picture it will bring up all of the different areas of their profile. Right below where they can share which organizations they belong to, they can add in the Certificate of Completion information to show it in their profile. Staff/Patrons cannot use the Share your Achievement within their profile in lyndaLibrary because they are logging into lyndaLibrary with their Library Card and pin/password, not the email address that is associated within LinkedIn. They can still share this information but it needs to be added by the Staff/Patron themselves. Guide to downloading Lynda.com MARC records More tips on editing MARC records can be found here. ↵Since 2003, the State Library of Ohio, OhioLINK (Ohio Library and Information Network), OPLIN (Ohio Public Library Information Network), and INFOhio (Ohio’s PreK-12 Digital Library) formed Libraries Connect Ohio as a partnership to define and deliver a statewide collection of databases to provide a common set of information resources. Since its formation, every five years the partners evaluate and select resources based on needs. Starting July 1, there will be several new resources available to public libraries as a result of this partnership: Hobbies and Crafts Reference Center, Home Improvement Reference Center, Small Business Reference Center, Chilton Library, Kids InfoBits, Transparent Language Online, Oxford Research Encyclopedias and Very Short Introductions. In addition, OPLIN plans to purchase a genealogy resource exclusively for public libraries. This resource(s) will also start July 1, 2018. Look for an announcement soon. Are you looking for knitting patterns, or articles about sailing? Or perhaps you’d like plans for building a garage workshop or instruction on simple wiring/plumbing projects. Maybe you’re ready to start your own business and need guidance in writing a business plan. You can find information on all of these activities, and many others using EBSCO’s Hobbies and Crafts, Home Improvement, and Small Business Reference Centers, which contain thousands of full-text articles, reference books, patterns, plans, forms and more. Join us for a 1-hour webinar with EBSCO Sr. Customer Engagement Specialist Joe Ceterski who will provide an overview of these three Reference Centers, including content description, searching and browsing techniques, and printing/saving/emailing full-text information. Please join this introductory session to learn more about the genealogy resources available for OPLIN libraries. This session will talk about things to think about before starting family history research. We’ll cover resources available in the databases that help organize research. We’ll also review basic genealogy practices that can lead to better outcomes. This webinar will be designed to help library staff as they prepare for their own onsite trainings for patrons or as they are working with genealogy researchers. This session will cover descriptions of the databases available to OPLIN libraries – Ancestry Library Edition, Fold 3, HeritageQuest and African American Heritage – but will not show searching or cover specific database information. Future sessions are scheduled for more in-depth searching, tips and content for the databases. Please join this 60 minutes session to learn more about these databases. This webinar will review and wrap-up the information covered in the previous sessions for Ancestry Library Edition, Fold 3, HeritageQuest and African American Heritage. This webinar will review unique content that can supplement family history research as well as content specific to the Ohio area. This session will tie together the previous sessions for a complete review and provide tips for next steps as researchers move along in their family history searches. On the table below, there is a side by side comparison of the current resources available to public libraries, and on the right, the new resources starting July 1, 2018.